Coup in Maldives: Adviser to Ousted Pres. Mohamed Nasheed Speaks Out from Hiding as Arrest Sought | Democracy Now! adviser on international media and communications, the President’s Office, Republic of Maldives. He is currently in an undisclosed location as he fears his own arrest. Maldives Independent News Site "Minivan News"
JUAN GONZALEZ: We begin today’s show looking at the tiny Indian Ocean state of Maldives, where the country’s first democratically elected president, Mohamed Nasheed, has been ousted in what he has described as a coup at gunpoint. Once in office, Nasheed became an internationally recognized leader on climate issues, as he urged the world to do more to save small island states from rising sea waters. MOHAMED NASHEED: If it was important for countries to defend Poland in the 1930s because it was a frontline state, it’s very important to take care of the Maldives now, because the Maldives and many other small states are in the frontline of what is happening to the world, to climate today. If you can’t defend the Maldives today, you won’t be able to defend yourself tomorrow. AMY GOODMAN: Ousted Maldives President Mohamed Nasheed once held a cabinet meeting underwater to highlight the threat of global warming to the Maldives. He also pledged to make the Maldives the first carbon neutral country and installed solar panels on the roof of his presidential residence. 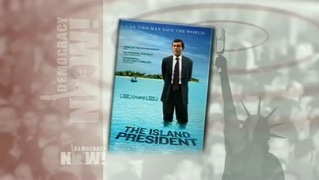 Nasheed’s rise to power is the focus of a new documentary called The Island President. This is an excerpt. MOHAMED NASHEED: If we can’t stop the seas rising, if you allow for a 2-degree rise in temperature, you are actually agreeing to kill us. I have an objective, which is to save the nation. I know it’s a huge task. I’ve been arrested 12 times. I’ve been tortured twice. I spent 18 months in solitary. We won our battle for democracy in the Maldives. A year later, there are those who tell us that solving climate change is impossible. Well, I am here to tell you that we refuse to give up hope. JUAN GONZALEZ: The trailer for the new documentary, The Island President. Nasheed spoke earlier today outside his home. MOHAMED NASHEED: They have issued an arrest warrant to arrest me. Now, the new home minister has pledged that I will be the first former president to spend all my life in jail. So, I think he is working on his delivery of his pledge. I hope that the international community will take note of what is happening in the Maldives. And if they can, do something right now; it certainly will be late tomorrow. REPORTER: Why do you say that? MOHAMED NASHEED: Well, we tend to work with facts on the ground. And tomorrow, the fact on the ground would be that I will be in jail, so it’s going to be difficult to rewind from there on. But it would be rather much more easier if people can start work now. AMY GOODMAN: That is the ousted president of the Maldives. We’re joined by several guests to talk more about the situation there and President Mohamed Nasheed, as well. We’re beginning with Paul Roberts. He served as Nasheed’s communications adviser. He was with Nasheed on the day of the coup. He’s joining us from an undisclosed location. We welcome you to Democracy Now! Can you talk about exactly what has happened, Paul? PAUL ROBERTS: Yeah. Thanks for having me, Amy. Let me tell you what I saw on Tuesday, when I went into work at about 7:00 in the morning. There was an almighty fight going on just outside the President’s office by the military barracks, where some protesters—I’d say about 500—had been joined with mutinying police officers, and they were trying to break into the main army headquarters, which is also the armory. Later that morning, we heard that the military police and other members of the military were joining the protesters, calling for the overthrow of the government. A little later, we heard that one of the ruling party offices had been ransacked by police, and then the national television and radio station had been stalled by police. The journalists had been rounded up and locked in a room, and the cables had been pulled. And they pulled off the state television from the air. But the thing that was my striking for me was, at just about 11:00—or, I’d say, just before 12:00 noon, the gates of the President’s office opened, and about three sedan cars swooped in with a jeep at the back. Nasheed got out of one car, the defense minister out of another. He was surrounded by 40 or 50 soldiers, some of whom were armed, and shepherded into a room. And I spoke to Nasheed this morning, and he told me that in that room army officers, who were carrying loaded weapons, told him that if he did not resign now, they would use force against him and his staff. So he wrote a letter of resignation, which the military kept. He was frogmarched to a press conference to declare his resignation. And he was taken to his house, where he was placed under military custody, while the Vice President, Waheed, quickly declared himself the new president. It was—it was deeply, deeply shocking. He goes on to say, quote, “Let the Maldives be a lesson for aspiring democrats everywhere: the dictator can be removed in a day, but it can take years to stamp out the lingering remnants of his dictatorship.” And he was referring, of course, there to the former—the former leader of that country. 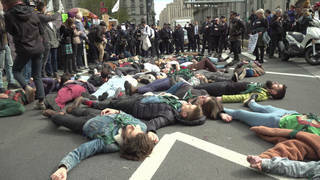 Could you talk about the ties, if any, between the protesters and the former leader? PAUL ROBERTS: Well, yeah, sure. The former leader was a man called Maumoon Abdul Gayoom. And he was a brute, in a word. He led the Maldives for 30 years with an iron fist. Political parties were banned. There was no freedom of expression. Every election, he won with 99 percent of the vote, and his was the only name on the ballot paper. And Nasheed led a nonviolent resistance movement against him that ultimately ushered in the democracy, which culminated in the 2008 elections, which Nasheed won, the first multi-party elections in the country’s history. And now the protesters involved in Tuesday’s—well, it is like—the coup were members of Gayoom’s party. But I stress again: there were only a few hundred protesters on the streets, which, in the Maldives, isn’t much. Nasheed and other parties regularly get a couple of thousand people to their normal rallies. So, this was not a revolution. Neither was it led by the rabble. It was a police mutiny, followed by a mutiny in the military. And it was the use of force that—it was something that Nasheed is saying—that forced him to leave office. AMY GOODMAN: I wanted to go back to what Mohamed Nasheed said on Tuesday, the day he announced his resignation. MOHAMED NASHEED: [translated] The way I saw it, if I were to keep the government in power, I would have had to use excessive force, which would have resulted in a lot of people getting hurt, which is the reason I came to the conclusion I did. At the same time, if I were to have taken steps to sustain the government, there is a strong likelihood of external influences. AMY GOODMAN: During a short interview with Al Jazeera the following day, Mohamed Nasheed said he was forced to resign in what he described as a coup. MOHAMED NASHEED: I was forced to resign. AL JAZEERA REPORTER: You were forced to resign. AL JAZEERA REPORTER: And in your perspective, this is a coup. MOHAMED NASHEED: This is a coup. It definitely is. If you find any definition of a coup anywhere, this is a coup. This is not—this is a bloodless coup, because I did not take part in it. I did not want to defend. That is why there was no blood. MOHAMED NASHEED: Because I didn’t want them to go shooting our people. AL JAZEERA REPORTER: And they were threatening. MOHAMED NASHEED: They were threatening me, and they were threatening the people. So I didn’t want that. 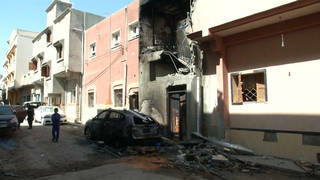 AL JAZEERA REPORTER: And where do you go from here? AL JAZEERA REPORTER: And you’re still hopeful? MOHAMED NASHEED: We are certain that the people of this country are with us. AMY GOODMAN: That is ousted President Nasheed. The State Department here in the United States has defended the ousting of President Nasheed and has confirmed the new leadership has been in contact with the Obama administration. Robert Blake, the assistant secretary of state for South Asia, is expected to visit Maldives this weekend. State Department spokesperson Victoria Nuland was questioned about the U.S. stance and Blake’s visit Wednesday. REPORTER: Are you going to withhold—I mean, are you taking any position on the suggestions that it might have been a military coup? Are you going to investigate that? Is Blake going to check that out? Or do you think that that’s not a sort of a reasonable suggestion here? VICTORIA NULAND: Well, obviously, we are talking to all parties. That’s why we’re sending our folks down. But that is not the information that we have at the moment. But Assistant Secretary Blake will have a chance to be there and talk to everybody on Saturday. But in the interim, we are urging calm, we’re urging dialogue, we’re urging the—President Waheed, as you know, has committed to forming a national unity government, and we think that will also be an important signal to political factions across the Maldives. REPORTER: Does that mean that a determination on whether this was an unconstitutional change in power is going to wait until after Blake’s visit? VICTORIA NULAND: Well, our view, as of yesterday—and I don’t think that that has changed; obviously we’ll collect more information going forward—was that this was handled constitutionally. AMY GOODMAN: That was State Department spokesperson Victoria Nuland. Paul Roberts, you’re the adviser to the ousted president, Mohamed Nasheed, speaking to us from an undisclosed location. Your response? PAUL ROBERTS: I think—in fairness, I don’t think the State Department are being malicious or [inaudible] anything more than and announces on what the information they were given on Tuesday. It was a cleverly orchestrated coup, because the army effectively put a gun to the President’s head and said, “Resign, or we’ll pull the trigger,” and therefore he resigned. They then placed him under military house arrest and didn’t allow him to speak, whilst the former vice president, Waheed, who we believe was involved in plotting the coup, was quickly ushered into office. So, from the outside world, who were unable to speak to Nasheed for much of Tuesday—certainly only in the very [inaudible] on Tuesday—it looks like the President had resigned and, as per the Constitution, the Vice President was sworn in. But it was only on Wednesday, when Nasheed was able to talk and some of his officials were able to flee the Maldives and tell the international community what actually happened, that the truth is starting to filter out. JUAN GONZALEZ: And what about the supposed pretext for these actions by the military: the government’s arrest of a senior judge? Could you talk about that judge and what the issue was that involved the judge and these protests that erupted in response to that? PAUL ROBERTS: Yeah, sure. 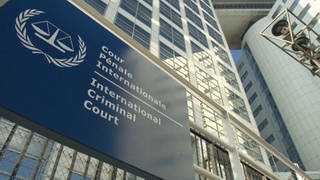 This judge was—he was the chief judge of the Criminal Court, which is one of the middle-ranking courts in the Maldives. And the government had accused him of defending the former dictatorship of Gayoom. There was a number of cases against former regime members for [inaudible] and corruption, and some involving hundreds of millions of dollars. And the government contended that this judge was essentially preventing those cases from ever reaching fruition. There also had been a Judicial Services Commission, which is a constitutionally appointed body to look into judges’ conduct. It also ruled that this judge was behaving in a way that wasn’t proper, and it asked for him to be disciplined. And the judge, effectively, was refusing to go and had even quashed his own summons by the police to come in for questioning. So at that point, the police turned to the military and asked for him to be detained. And, you know, this was the excuse for some of the protests that we then saw. But again, I stress that the protests, while they were noisy and loud, there were a maximum 400 or 500 people every evening. That’s not enough to bring down a government. There’s 100,000 people in Malé, and Malé is a sort of a wealthy, urbane community that leans very, very heavily towards Nasheed. And in fact, in the local elections last year, Nasheed’s party one nine out of the 11 seats there. So, this was not a popular uprising. This was done by the security forces. AMY GOODMAN: We’re speaking to Paul Roberts, adviser to the ousted Maldives president, Mohamed Nasheed. We’re going to go to break. When we come back, we’ll also be joined by the founder of 350.org, Bill McKibben, as well as the filmmaker who just finished a film called The Island President about President Mohamed Nasheed. Jon Shenk will be joining us, as well. Stay with us. AMY GOODMAN: We’re talking about the coup in the Maldives and the ousting of the president there. In October 2009, Maldives President Mohamed Nasheed held a cabinet meeting underwater in an attempt to bring attention to the dire consequences of global warming. Nasheed and 11 of his government ministers wore scuba gear and plunged nearly 20 feet into the Indian Ocean. PRESIDENT MOHAMED NASHEED: We are actually trying to send our message, let the world know what is happening and what might—what will happen to the Maldives if climate change is not checked. This is a challenging situation. And we want to see that everyone else is also occupied as much as we are and would like to see that people actually do something about it. AMY GOODMAN: That is the ousted president, Mohamed Nasheed, of the Maldives. 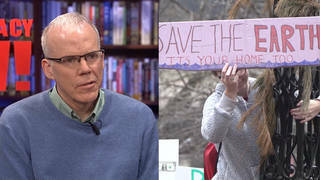 Bill McKibben, you’re founder of 350.org. Talk about what has happened this week. BILL McKIBBEN: Sure. Look, Nasheed, who I know a little bit, is a remarkable man for two reasons. One, he was the—in certain ways, the first precursor of the Arab Spring, the Mandela of the Indian Ocean, you know, who really brought democracy to a country where it hadn’t been before. Second, he’s been the most outspoken head of state around the issue of climate change on our planet. He has provided the leadership, both symbolic and practical, that we desperately need. You know, until Tuesday, the Maldives was on target to become the first carbon neutral nation on earth. 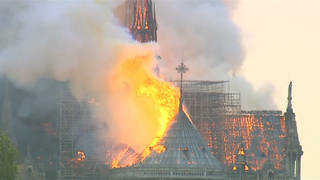 That won’t save the climate, but it’s the kind of thing that should shame the West into beginning to act itself. They also were—he and his government did a tremendous job of cooperating with activists around the world to try and bring attention to this most desperate of problems. JUAN GONZALEZ: And Bill, the denial of the State Department that this is even a coup? BILL McKIBBEN: You know, it’s so depressing to hear that. Let’s hope that the State Department is getting new information. We’re sending more than 30,000 signatures over there today that we’ve gathered in the last few hours from people around the world in the 350.org network who are incredibly upset at what’s going on. I was at the Maldives 20 years ago, at the height of the Gayoom thugocracy, and it was an unpleasant place—people with machine guns on corners and things. Malé, the capital, during the Nasheed years was a very different place: open, vibrant, alive democratic, humming with people trying to make a difference in the world. It’s just the saddest of thoughts to think that we might be moving backwards and that the State Department—I mean, one trusts that they’re not—you know, that they’re taking this seriously. Clearly, in certain ways, Nasheed was a thorn in their side, because he kept bringing up the topic of climate change, a topic they’re not that keen on. On the other hand, he, almost to a fault, was cooperative with U.S. efforts to try and do something—you know, what little we’re doing—about climate change. The State Department owes him, and I hope that they take this seriously. AMY GOODMAN: Let me turn to a new documentary, The Island President, about Mohamed Nasheed, the one we just played a clip of, directed by Jon Shenk. This part looks at Nasheed’s time as a political dissident under the old regime. PRESIDENT MOHAMED NASHEED: After graduation, I came back to the Maldives. By this time, the state had become more and more repressive. So we decided that it would be good to come up with a magazine. MOHAMED ZUHAIR: Nasheed and I and a few others began a publication called Sangu, which was a political publication. PRESIDENT MOHAMED NASHEED: It was talking about two things: corruption and human rights abuse. It was very critical of the regime. One night, at about 3:00 in the morning, they came to my house. They raided my home and took a whole lot of papers. LAILA ALI: They came in. They took him away. It was in the middle of the night. I mean, we had heard so many stories of what they were doing in the jails and all that, so it was terrifying, you know, really. AMY GOODMAN: That was Mohamed Nasheed’s wife. PRESIDENT MOHAMED NASHEED: I refused to give a confession. So, because of this, I was taken to a corrugated iron sheet cell. The whole cell is five feet by three feet. You had a mat. That’s all. AMY GOODMAN: Mohamed Nasheed eventually went into exile but returned to Maldives to lead a fledgling pro-democracy movement. Here is another excerpt from The Island President. PRESIDENT MOHAMED NASHEED: The Maldives was looking very much like an occupied country. PRESIDENT MOHAMED NASHEED: Demonstrations were taking place all throughout the country. There were huge demonstrations in Fares-Maathodaa, Thinadhoo, Kinbidhoo, Ukulhas—you know, many, many, many islands. This was spreading like wildfire. It just finally came to a point that Gayoom had to relent, and he had to allow free and fair elections. AMY GOODMAN: An excerpt from the new documentary, The Island President. We are joined by Jon Shenk, who’s its director. This news—you have spent a good deal of time with the ousted president in the Maldives. This history—he has been held, he has been beaten and tortured by the ousted—by the former dictator. What about what’s happening now, Jon? JON SHENK: Well, thanks for having me. You know, when I arrived in the Maldives in 2009, a few months after the first-ever democratically presidential held election there, it was a—it was a very strange place. You know, on one hand, you had people who were clearly still looking over their shoulders from, you know, decades of having lived in a police state. And then you had, on the other hand, Nasheed and the new fledgling democratic government there, you know, acting in the most open, kind of democratic, transparent way that you can imagine a good government acting. So, what is happening now, in some ways, is obviously shocking and stunning and, to those of us who know Nasheed well, very sad—but not surprising, given just the kinds of things that we heard during the making of the film, which is that, you know, it’s in a small country that was ruled for so long by an entrenched dictatorship. You had so much of society, you know, sort of, quote-unquote, “in his pocket,” or, you know, sort of—or at least fearful of repercussions that might occur, you know, speaking out against him. Your response to those WikiLeaks documents? PAUL ROBERTS: Yeah, sure. I mean, I was in Copenhagen with Nasheed, and I saw him battling very vigilantly to get a deal. We were very nervous at that point that there would be no deal, with this almighty row that was breaking out between America and China. And eventually we did get a deal. It was a very bad deal. It was a very poor deal. It was a compromised deal. But it was a deal. And Nasheed played an instrumental part in that and in preventing those talks from collapsing. And then, you know, we’ve—since then, we’ve had some baby steps forward in Cancún and Durban, which seems to sort of justify his decision to keep the U.N. talks on the road. But, I mean, the last day of Copenhagen, Nasheed said publicly, and in writing, that the Maldives had written—sorry, had supported the Copenhagen Accord. So this was two months before these meetings. But the—you know, one of the key parts of any U.N. accord is that some of the poor, vulnerable countries, like the Maldives, but like many others in Africa, have to spend an increasing proportion of their budgets on adaptations. In the Maldives, this is tens of millions of dollars on sea walls and beach revetments and stuff to protect these islands from the rising seas. So, you know, what the Maldives was saying was that, you know, if we can have some help, then—you know, then that’s great, and for other developing countries, too, that needs to be part of the accord. And suddenly there’s at least $50 million worth of sea walls and revetments and water breakers that are in need of building in the Maldives alone. But I think one thing where some of the analysis is incorrect is that somehow the Maldives kind of used money as a bargaining chip to sign on to the accord. That’s not true. We had already signed on to the accord a month, months or weeks before any of these meetings took place. AMY GOODMAN: Did the U.S., Paul, deliver the money, the $50 million? PAUL ROBERTS: Well, we never asked them for $50 million. If you look at the cable in detail, what it says is we have $50 million worth of adaptation that we need doing, and so, if anybody would like to help, that’s great. And, you know, of course, one of the big things at Copenhagen was that there was supposed to be this transfer from the rich to the poor to help pay for these sorts of things. But no, Amy, no, they didn’t deliver a cent. There’s been no financing from the U.S. for any adaptation in the Maldives. AMY GOODMAN: So what’s going to happen now, Paul Roberts? You know, we go back to different attempted coups. In Venezuela, Chávez refused to sign a resignation letter, which seemed very important to the coup makers. He remained in office. President Aristide in Haiti was being pushed to sign a resignation letter by the—one of the U.S. officials from the U.S. embassy before he was ousted the second time. He did sign, and he was ousted and could not return. What’s going to happen now to your president, as we wrap up? PAUL ROBERTS: Well, we’re very concerned. We think—you know, the new regime have got the—they already had—they always had the judiciary in their pocket. They’ve now stormed the state TV, so they have—they basically have most of the fourth estate in their pocket. They now have the executive in their pocket. And they’ll probably be able to get the legislature in their pocket, as well. The only thing they don’t have in their pocket is the fact that Nasheed is still extremely popular, then likely to win any new election. But this is where I think there’s another insidious thing going on. I think they are trying to arrest him. They’ve said they’re going to have 14 cases for his arrest. And I think what they will do is they’ll try and charge him with anything, with something, so he’ll have a criminal record, and that will prevent him standing in any future election. AMY GOODMAN: Well, we thank you very much for joining us, Paul Roberts, adviser to the Maldives. Can you say where you are? PAUL ROBERTS: I’d rather not. There’s been arrest warrants out for all of Nasheed’s former aides. AMY GOODMAN: As well as yourself? PAUL ROBERTS: I believe so. AMY GOODMAN: Paul Roberts, speaking to us from an undisclosed location, an aide to the ousted president, Mohamed Nasheed, of the Maldives. Jon Shenk, thanks for being with us. 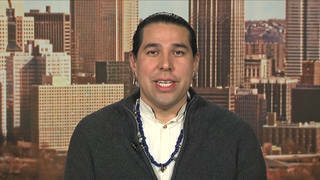 His new documentary film, The Island President, has premiered at the Sundance Film Festival. Before we go, Jon, what will you do with this film now? It seems this is the point, more than ever, to get this information out. JON SHENK: Yes, absolutely. You know, the film is being distributed in the U.S. by Samuel Goldwyn Films, and we’re moving ahead with our release next month, and obviously trying to get the word out. I think that, you know, one remarkable thing about the film is that it really is an unprecedented look at a sitting head of state. To my knowledge, no other project has ever followed a head of state with such transparent access. So I think, just by the nature of watching the film, I think people will get a sense of who the real Nasheed is. It’s kind of undeniable that he approaches his presidency, and pretty much everything he does, with just, you know, honesty and openness and a can-do attitude. AMY GOODMAN: Jon Shenk, director of The Island President. And Bill McKibben, thanks very much for being with us, founder of 350.org, among his books, Eaarth: Making a Life on a Tough New Planet.